The world of acquiring finances for a small business has changed and the process of getting a loan can be quite nerve racking. The initial phase prior to getting a loan requires you to know which documents to prepare, how much financing to ask for, and, most importantly, which lenders to approach. The following are some of the steps that you need to know about in order to qualify for a small business loan. Identify why you need the money and pin down the list of reasons on how this loan will help your business. There can be various reasons such as getting a loan to launch a new business, buy an existing business, purchase a piece of equipment, or for your day to day working capital to pay for marketing or human resource costs. Moreover, you may need the loan to cover your cash flow gaps or perhaps an opportunity has arisen to expand your existing business. The key is to recognize and evaluate your reasons as it will help you to decide the choice of the lender and loan type. A small business loan can be helpful in many ways, but it is essential to know the amount of capital you need in order to achieve your business goals. It inevitably does not have to match up with how much you can afford. You can use a business loan calculator that will help you evaluate the monthly expense of your loan, which is essential to know before you sign a loan agreement. Another way to find out how much financing you need and how much you can afford is to conduct a loan performance analysis. By conducting this analysis, you will able to calculate the correct amount to move ahead with your business loan. Find the right loan. Choose a type of business loan based on your needs. The key is to know which type of loan matches with your credit score, your budget, and the reasons why you need the financing in the first place. You can get small business loans from several places including banks, financial institutes, micro and online lenders. Furthermore, common types of bank loans include equipment financing, short term loans for 2-3 years, or long term commercial loans which are usually secured by real estate. One of the most common loans among small business owners is a line of credit. They make a great security net in case of an emergency, thus offering an amount of capital that can serve as a cushion for your cash stream. Once you have compared your options on the different types of business loans, it’s time to put your documents together. Depending on the bank and type of loan, you will need to submit a combination of documents such as business and personal bank statements, tax returns, annual revenue, financial statements (balance sheet, profit loss statements) and other legal business documents. The best thing you can do is sufficiently organize all of your documents to submit with your loan application and be as prompt as possible. Once you have prepared all of the documents, you can submit your loan application. It is advisable that you don’t apply for more than one or two loan types as this will affect your credit score in the long term. After you have submitted your loan application, it will take a while for your lender to review all of your documents and verify the authenticity. Once your application is approved, before signing any papers, make sure that your lender informs you about the loan and its complexities. 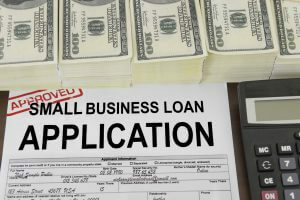 For small businesses, getting a business loan is often a difficult obstacle to overcome, mostly due to tight lending principles made by banks. Although applying for and getting approved for loans can be tricky, if you prepare your application well, the probability of receiving the loan amount will be higher. https://www.completecontroller.com/wp-content/uploads/cclogo_main-long-300x63.png 0 0 Complete Controller https://www.completecontroller.com/wp-content/uploads/cclogo_main-long-300x63.png Complete Controller2018-08-24 11:29:372018-08-24 07:19:00What Does It Really Take to Get a Small Business Loan? What is Loan Amortization and How Does it Work?